The Handmaid’s Tale is less a dystopian nightmare about Trump’s America than a comforting fiction we tell ourselves. #Gilead, a reference to the regime depicted in Atwood’s story, was used in response to images of an all-male panel at the White House debating maternity services. Women in handmaids’ robes and bonnets protested abortion restrictions under consideration at the Texas state capitol. At the Women’s March, protesters held signs that read, “Make Margaret Atwood Fiction Again” and Atwood herself has said her work is a warning for the Trump age. In the story, a religious coup has ushered a theocracy in to the United States where fertile women, stripped of their rights and reduced to reproductive chattel, are forced to bear children for their society. So what does this tale tell us about America in 2017? US fertility rates are the lowest since records began in 1909 at about 1.85 births per woman. The US population, in other words, is no longer “naturally replacing” itself. Unlike the tale however, this is not due to ecological disaster. Today women’s long work hours combined with the continued burden of domestic work are causing increased levels of stress and ill health, with short maternity leave, expensive child care, and a low level of social prestige to the unpaid work of motherhood and domestic labor. Despite all of this Pew research shows that while birth rates may have collapsed the desire to have children has not, with the ideal in polls still remaining “two or more,” and 40 percent of American women nearing the end of their childbearing years having fewer children than they would like. The real-world dystopia for the majority of women in the age of Trump is not that they are being forced to have children by a repressive traditonalist state but that they’re being compelled not to by far more insidious forces, and those that do are financially and socially punished at every turn. As an active supporter of the pro-choice movement I regard family planning in all forms as one of the great human advancements. But new problems call for new ideas and women face many today. As with so much progressive discourse, we still talk as though it were the 1950s, the nuclear family was still intact, and an ultra-traditonalist, tyrannical patriarchal order reigned. We like to imagine ourselves fighting the simpler battles of the cultural revolutionaries of the sixties. What has happened instead, a half century on from the sexual revolution, is something more complicated — a total hegemonic fusion of the corporate and the countercultural, of progressivism, modernity, and the market. It is pregnancy, not birth control, that burdens our current system with awkward unprofitable human functions and needs. The mythologies of our age in the West are not enforced by repressive theocratic regimes, but by the market command to be free, to be creative, to be flexible, to love what you do for even the most uninspiring of jobs. Work flexibility and freedom from ties to family duty and hierarchical institutions promised by the corporate-counterculture that reached its zenith in the 1990s has turned out to mean increased precarity and a race to the bottom in living standards. The promise of this vision has become, for those who can’t enter adulthood but are edging closer to natural infertility, a permanent CV-building career ladder leading to nowhere. Trump’s courting of anti-abortion conservatives and the fervent anti-feminism of his online traditional wife-seeking male fans certainly suggest a worrying turn but we are still far from Gilead. The real material unfreedom women experience today is a product of the subordination of everything to the market, not to traditionalism. Indeed, the rightward turn represented by the emergence of the youthful Trumpian right may be in part a product of the failure of progressive movements to diagnose our new problems of loneliness and atomization with calls for more of the sixties — individual freedoms, self-expression, and non-conformism. Today, women having children are treated as an expense and a nuisance. Traditionalists long for a past to which they can never return. But in an age of automation we should all be working less and having more time for the things that give life meaning yet somehow the reverse has happened. The adaptation’s stunning imagery explicitly draws from America’s early Puritan settlers mixed with elements of modern authoritarian regimes. So this at first appears to be a kind of American self-criticism, a story of what America in part was and may become again. But the imagery could also be read as less explicitly conjuring some more troublesome dystopias in the liberal unconscious for a modern secularized nation founded on Protestantism. There is a distinctly Catholic clerical quality to the dramatic dark red robes in these Magdalene-laundry-style institutions and flashes of public hangings and cloaked women resemble something closer to modern-day Saudi Arabia. In a modern America characterized by the collapse of institutions, family, and religion, this alternative reading would certainly suggest itself as just as plausible. 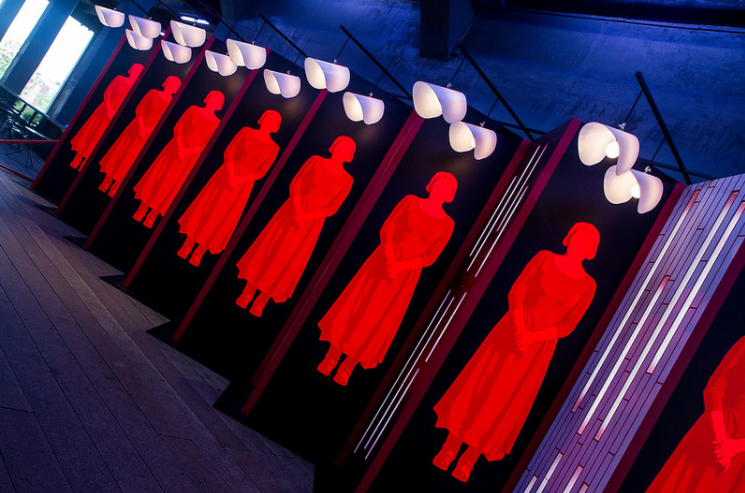 In so many ways The Handmaid’s Tale is less a dystopian nightmare about Trump’s America than a comforting fiction that progressives tell ourselves, that we’re still fighting the simple battles of the past. Even the Reagan and Thatcher era despite its much more militant conservative rhetoric than anything found in the Trump administration, succeeded only in bringing about more market liberalism in which cultural liberalism continued to flourish. Pretending we live in a perpetual 1950s is not going to help us to think through our new problems, let alone solve them. Childlessness, just like childbearing, is not a freedom unless it’s a choice. The traditionalists who wish to take away women’s reproductive rights are a real threat that we should continue to fight. But the much greater yet more inconspicuous dystopia all around us today remains the pressure of the market to make profit for others and call it freedom, to remain ideal employees even at the expense of life itself. Angela Nagle is a cultural critic for the Baffler, Current Affairs , and Dublin Review of Books .